Tess Finkle likes to call Laura Michael the yin to her yang. 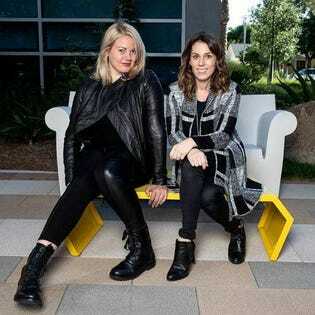 It’s an endearing sentiment from the two co-founders of Metro PR, a female owned-and-operated agency that specializes in digital entertainment, and one that emphasizes their ride-or-die bond together in business. Currently, Metro PR’s client roster boasts a wide range of influencers, brands and networks. These include, but are not limited to, comedian Amanda Seales, actress Angela Kinsey, writer and producer Dan Harmon, inspirational publisher SoulPancake, World of Wonder, RuPaul’s DragCon, VidCon and BeautyCon. This roster didn’t exist when Finkle and Michael first started their agency. Tess Finkle and Laura Michael co-founded Metro PR when they were 22-years-old. They did not have clients or entertainment industry connections, so Finkle and Michael knew they had to be really good if they wanted to succeed. I was lucky to chat with Finkle and Michael about the evolution of the Metro PR business model and which lessons made the biggest impact on the duo as they navigated the public relations industry. Deborah Sweeney: Let’s go back to the beginning, before Metro PR. What was your work background like? Did you have prior PR experience? Laura Michael: I studied communications and business marketing at Temple University. I lived at home for six months during my junior year to save up for a car that I used to drive from PA to CA to intern in Los Angeles that summer. I interned (for free) at one of the most popular entertainment PR conglomerates at the time, while working as a nanny on my days off to pay for the couch I slept on for three months. The assistant I was helping had to go on tour with Netflix halfway through the summer, so I got to step in and do actual work. I was excited to have the experience, but completely broke by the end of the summer. A well timed, $500 school grant gave me just enough gas money to make the drive back from Los Angeles to Philadelphia. I worked two PR and marketing consultation jobs during my senior year. When I returned to Los Angeles the summer after graduating, I was offered the opportunity to skip being an assistant and become a publicist right away. This was a blessing, as I would have been a terrible assistant. I met Tess six months later at a SAG after party, where she convinced me to come over to Metro within the first five minutes of chatting — and the rest was history. Tess Finkle: I graduated from Phillips Exeter Academy in 2002, and moved to Southern California to get reacquainted with sunshine and a community where it’s socially acceptable to have messy hair. I attempted college, but quickly withdrew myself to move to Hollywood at the age of 19. I decided that sorority dues would be better spent on living around the corner from the Guitar Center on Sunset Blvd and frequenting nightclubs. I told my parents that I am “smart enough,” when I broke the news that I dropped out of college. I was immediately cut off and financially on my own, which was part of my agenda. My love for the character Sue Ellen Crandell, played by Christina Applegate in the movie Don’t Tell Mom The Babysitter’s Dead, fueled my hustle to break into the entertainment industry as a teenager. I dabbled in management and production before landing on PR, which came with more free swag and parties. Again, I was 19, so my priorities were what they were. I started a PR company without knowing how to write a press release. It was Laura who taught me how to write one. We are the definition of Yin and Yang. That said, I looked at public relations as getting from Point A to Point B. My methods worked. I think the press liked that I reached out to them like an everyday human versus using a body of canned responses and “rules” from a textbook. Deborah Sweeney: How did you decide a PR firm was the right business to start up? Tess Finkle: Laura and I share a profound love for the entertainment industry and business. At our core, she and I are storytellers and problem solvers. PR very much welcomes these qualities. How do you get people to talk about something? How to you get people to discover a new idea? How do we get the media to be as excited about something as we are? Having our own shop has allowed us to choose our projects instead of being assigned to accounts. Naturally, we lean towards clients and brands that inspire us. Deborah Sweeney: What makes Metro PR stand out from other PR agencies? Tess Finkle: We started with no nepotism, no clients, no investment, no significant time spent at other companies where we were able to build an A-list roster and leave with said roster to start a new, proprietary company. One thing still remains our lead value: we had to be really good. We are results driven, because it was the only reason to give people to hire us. It still is. We stuck our flag in the digital sector very early, about 2 years after YouTube launched, and are a unique blend of the old school methods we learned at the beginning of our careers, mixed with very specific knowledge stemmed from Metro growing up in the digital era. Laura and I also have athletic backgrounds, so we approach our work with the mindset of wanting to win. Nothing feels better than reaching a goal. We call our clients before they call us, we pitch them ideas that aren’t on their radar yet, we create work for ourselves if we are between campaigns with clients who are still paying us. We earn our keep and we do not take any piece of it for granted. Laura Michael: We instill all of these values in our employees. Tess Finkle: This business, and life, is a house of cards. We never get too comfortable or rely on whatever laurels we have at this point. Deborah Sweeney: You had everything going against you when you first started out — no investments, clients or connections. What was the process like to overcoming these hurdles? Tess Finkle: The cards were stacked against us in the beginning, but it would be unfair to not recognize that there are many people out there that have it tougher than we did at our start. We were both fortunate enough to have access to quality education, albeit mine stopped just after high school. This counts a lot and it’s something we recognize as a great part of our success. The hardest part of the early days wasn’t even the fact that we had very few clients and that nobody knew who we were. It was not having any regularly available mentors. There was one woman who was a veteran in the business and would take our call at times. She has since retired. Laura and I had each other. When I am down, she finds a way to be “up” and be the rock. When she is down, then it’s my turn. Having a partner, one that is a real match, is the secret sauce to starting something that might actually last. Since the early days, we joke about trying to pick up where the Spice Girls (at their height) dropped off. Like all jokes, there is a bit of honesty to it. Find a woman that really has your back, and go! Deborah Sweeney: Which mistakes made in Metro’s early days in business do you cringe thinking about? Laura Michael: We had a certain naivete that there would be that one big client or big break that would forever change our company. We traveled all around the world in pursuit of those types of leads — Northern California, New York City, Europe, Asia and more. In the end, what we learned was you have to build your company brick by brick, client by client, case study by case study. We would knock it out of the park with each new client and use that case study to open a new door. Tess Finkle: It took us a long time to learn how to hire the right people for our team. We were underdogs, so we looked at people the way we wanted to be looked at. We wanted to take a chance on them and be impressed by their work and proud of ourselves for seeing something in them that nobody else did. Just like personal relationships, people show you who they are very quickly. As we matured, we learned that what you see “day one” is usually what you get, so we landed on asking better questions to get a stronger feel of our candidates. Deborah Sweeney: Tell me about the major breakthrough that put Metro PR on the map. Laura Michael: We started as a talent company, representing traditional film and TV stars. When we looked around the industry, we noticed two things were happening to other boutique talent PR companies. Either you would build a client to the A-list and they’d leave you (which happened to us), or you would have to charge half the price of the bigger companies and do twice the work. We realized this was not a sustainable business model to ever grow a business — and we wanted to grow beyond the boutique model. We saw an opening in the digital media space. At a time, no one else was focusing on this sector. We got in early, building our reputation as the best company for digital media companies in need of B2B and content PR. Eventually, our reputation brought us larger, traditional networks and studios looking to innovate within digital and direct-to-consumer marketing. We still work with the top digital media companies, but our clients also include the biggest traditional studios in Hollywood. Our early entry into the space also exposed us to every aspect of new media, from analytics to influencer marketing to the building blocks of what makes content viral. Beyond PR, our clients now hire us to consult on all elements of their content and marketing efforts. Tess Finkle: There was another defining moment for Metro, which happened when we were on the brink of collapse a handful of years into our start. We were a team of three, including myself and Laura, and were about to hit that dead end that 90% of startups hit within their first five years. A comedy of errors put us in the mix to handle a UK-based company that was gearing up to launch a worldwide product that sits at the intersection of fashion and technology. Their budget was 4x of our highest paying client at the time. It would be a game changer for us. We had a preliminary call with their CEO, during which it became glaringly obvious on our end that we not have the experience that a PR partner should have on this account. This did not stop us. The CEO said we needed to meet him in Las Vegas at an expo for a second, in-person interview. Laura and I couldn’t afford flights, so we hopped in the car for a road trip. About halfway there, we realized we did not have a real pitch or presentation, and that the odds were high that we were going to be asked to talk about anything we’ve done that’s relevant to this client and their forthcoming product. We pulled over to the nearest Olive Garden, popped open our laptops, and created a deck with case studies that were as stretchy as the mozzarella sticks. We arrived in Las Vegas, booked a $60 a night room at the Excalibur Hotel and had a meeting with the CEO. It did not go well. Again, this did not stop us. We loitered in the lobby where he was staying, spotted him as he was walking to a meeting and kept pitching ourselves to him as he speed walked. There was no escaping us, which is part of the pros of starting a company when you’re young and feel invincible. By the end of the walk, he invited us to his company’s cocktail reception where, “the other PR companies in the mix would be.” By the grace of Wayne Newton, we ended up getting the account and turned our company around. When it comes down to it, Laura and I will always figure it out. Deborah Sweeney: In the last three years, Metro PR has grown tremendously. What advice would you offer to entrepreneurs experiencing substantial growth of their own? Tess Finkle: Culture first. The bigger the team gets, the more people you have that are choosing to give their time to you and your vision. Give back to the good ones and be aware of the balance of your staff. Is everyone doing their part? If they aren’t, be quick to keep adjusting and protect your vision. Also, own your mistakes. You’re going to make them, especially as your team expands and your role as a leader becomes heavier. How you handle your mistakes sets the tone for how your team will handle theirs. Be open, honest, humble and learn. Laura Michael: Know what you know and more importantly, what you don’t know. Make sure you have good business management and HR resources. Trying to do everything yourself may save a few dollars in the short term, but the time spent and mistakes made will be more expensive in the long term. Deborah Sweeney: What are your long-term plans for the business? Tess Finkle: I aim to stay true to our nimble roots. No matter how big we get, I want to continue to move quickly, to not get too attached to a specific direction in a world that changes by the minute and to foster a healthy work environment. I’ve had Metro for 12.5 years, and not a single day feels like work. We also want to be the mentors we never had to the women that work for us and that surround us. There are a lot of events, power breakfasts, summits and panels about women helping women. I love a great tea party, but the real change comes from the days in-between these events and how women treat each other each day, off stage and off camera. Deborah Sweeney: For other twentysomethings that wants to start their own PR agency, what advice would you give them before beginning? Laura Michael: There is no way I would still be doing this without Tess as a partner. You need that person who will tell you when your idea is amazing and go down that road with you. Even more than that, you need that person who will bring you back down to Earth when your idea may derail your momentum. Like Tess said — the Yin to your Yang above all else!